Asperger's Disorder was first described in the 1940s by Viennese pediatrician Hans Asperger who observed autistic-like behaviors and difficulties with social and communication skills in boys who had normal intelligence and language development. Many professionals felt Asperger's Disorder was simply a milder form of autism and used the term "high-functioning autism" to describe these individuals. Professor Uta Frith, with the Institute of Cognitive Neuroscience of University College London and author of Autism and Asperger Syndrome, describes individuals with Asperger's Disorder as "having a dash of Autism." Asperger's Disorder was added to the American Psychiatric Association's Diagnostic and Statistical Manual of Mental Disorders (DSM-IV) in 1994 as a separate disorder from autism. However, there are still many professionals who consider Asperger's Disorder a less severe form of autism. ‘Using the scanner, we could look around the brain for this information and read out something that from the outside there's no way you could possibly tell is in there. It's like shining a torch around, looking for writing on a wall,’ said John-Dylan Haynes at the Max Planck Institute for Human Cognitive and Brain Sciences in Germany, who led the study with colleagues at University College London and Oxford University. Fear not. Alex Jones is on the case. Those nosy neuroscientists don't stand a chance. Someone with Asperger's might, David - they're collectors of all sorts of xxxxe. But then so might anyone. It's the sort of question that leads nowhere and doesn't have any particular answer that can be deemed probative. yet when needed to prove he worked at Pfiester in 55... his W-2's are "found" to be among his possessions although not listed on a single inventory of items taken from him from any location? This is what you are reduced to. Sorry David. It's not good enough to prop up a theory. So sorry you feel that way Greg... did you happen to find where they listed finding his W-2's in the DPD inventories from 11/22 or 23? You claim they were found among Oswald's possessions - yet also claim they are not in any DPD evidence list or photo. So my question to you is - if they were not on any list or in any photo, how do you know they were alleged to be found among Oswald's possessions? Is it in a DPD memo that they were found there? Did someone give testimony that they were found there? Let's assume that they were found there. How is it that the DPD knew not to list them and not to photograph them? Or were those lists and photos ALSO faked later by the FBI? No one thought that through very well, did they? I'm guessing that you say they were found in Oswald's possessions because Armstrong assumed they were and as always, his assumptions morph into facts. I don't pretend to know the circumstances of the chain of possession, but my own assumption right now is that the WC requested the FBI to obtain the forms. Furthermore, since I have already established Oswald was in Ft Worth from Aug '56, I see no reason for the forms to be faked. They are genuine because the evidence puts Oswald at the dental clinic exactly as the records indicate. I'm sorry, but I have little idea of what you're talking about here in that last sentence. Even if the FBI only really took half the items - the remaining would have been inventoried and initialed in Dallas... Except maybe they DID take all the items?? Mr. EISENBERG. Do you know why Exhibit No. 820 was not reprocessed or desilvered? Mr. CADIGAN. No, this is a latent fingerprint matter. 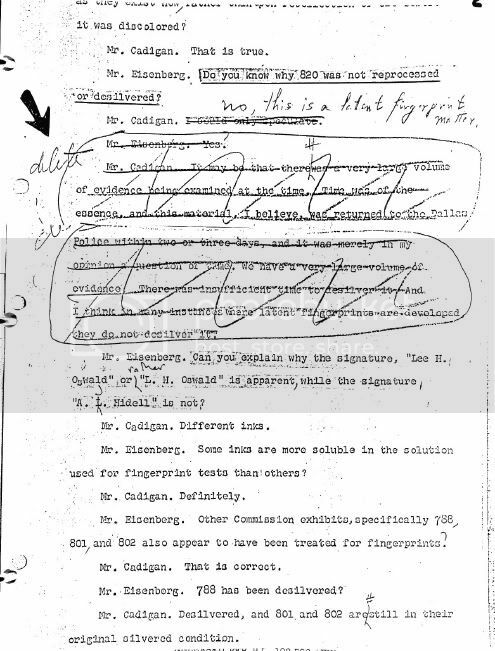 Do we understand that ALLEN DULLES SIMPLY WROTE IN CADIGAN'S RESPONSE and THAT'S HOW IT WAS PRINTED IN THE REPORT? Can you tell us Greg, how many other bits of testimony were summariuly changed to suit the Commissioner's purposes... wasn't Dulles at more WC sessions than anyone else? There was insuffieienct time, with the resources of the FBI in DC, to fingerprint and de-silver the LARGE VOLUME of evidence... does that sound like a couple hundred or almost 500? Any reason you can think of for Dulles not to want to publish that the FBI had the evidence, ALL THE EVIDENCE, that weekend? The ONLY initials on the W-2's are "168RF"... Robert Frazier and those are on the BACK of the COPIES of the W-2s. You'll be able to show us a Chain of Custody for these W-2's - right? You know like all the other COC's that are so reliable like CE399 and those shells POE marked that disappeared. It's a question that appears to be based on assumptions made by someone without any critical thinking skills. See above for why. Does it sound logical to you that a 16-19 year old who then travels the world would YEARS LATER still have the W-2's from part time jobs from which he already - supposedly - filed returns for? And if you are convinced this is possible and likely... prove they were found in Oswlad's possessions..
LOL. Provide the evidence suggesting that officials ever claimed they WERE found in Oswald's possessions and we''ll proceed in a logical and orderly manner from that starting point. Fair enough? Someone with Asperger's might, David - they're collectors of all sorts of xxxxe. But then so might anyone. It's the sort of question that leads nowhere and doesn't have any particular answer that can be deemed probative. DJ:OK - anybody can do anything.... it is just not very likely. DJ: 200 items or more were taken to DC by FBI on the 22nd... agree? 455 items are returned yet when photographed before going back to the FBI AGAIN, hundred of the photos do not come out. Of the items returned there are half that have DPD initials for a COE, and half that do not have anything to identify that item having ever been in Dallas... Oswald's W-2's for example and CE399. If an item of evidence cannot be traced back to the location it was found, what if any value does it have as AUTHENTICATED evidence? DJ: ok.... here is a page from the alphabetized list of evidence, where found and what FBI item # it becomes.... Please see if you can find these on ANY inventory of items taken from Irving... I believe they may be Stoval A&B exhibits.... I haven't seen them on those lists other than "Personal papers".. You? "ALL PROPERTY HAS BEEN INITIALED AND MARKED FOR EVIDENCE BY STOVAL AND ROSE"
Care to show us their marks on the W-2's Greg? Let me get this straight, David. I ask for evidence that anyone ever claimed that the W-2 for Pfisterer was found among Oswald's possessions... and you reply that it is not listed in any evidence list or shown in any photo (repeating what you've already said)? So you're saying that because they're not listed as found there - that proves they must have been found there? David, that's not outside the box - it's off the planet. Please try and see where your claim logically leads.... if the form was found there as you claim, but is not among the evidence lists or photos, then one of the following must be true: ( a ) The DPD knew that this item was a problem and therefore deliberately kept it off the lists and out of photos; ( b ) they somehow accidentally left it out or; ( c ) it was not left out and the FBI later recreated the lists and photos without that item. It is your claim that the form was indeed among Oswald's possessions. Surely you can provide at least a single piece of evidence to back that up? I don't know the chain of custody for it because I don't have a desperate need for the FBI to have forged the form. I have already demonstrated that Oswald worked there just as the official record shows. I have also provided a possible alternative explanation as to why the item is absent from your lists: The WC did, from time to time, request the FBI to obtain affidavits, or particular documents. Maybe this was one of those times when such a request was made? We cannot start from a starting point that you're merely assuming from wishful thinking - otherwise we end up going down blind alleys. Provide actual evidence to back up your claim that it was in Oswald's possessions, or admit that you can't. If you provide - great! Then you have me engaged. Until then, like I said... this isn't enough to prop up a theory. It is the claim of the DPD.... I posted the evidence page that supports that DPD SAYS they were found at the Paine residence... the notebook with TAX related items listed and numbered on the "T" page above.... # 168, 169, 175 ??? you did see that right? and it says (IRVING) yes? Does this not mean to you that these forms were found in IRVING and subsequently given #168 and turned over to the FBI with all the other items that had been to DC and back. This page was SUPPOSEDLY created from lists of evidence collected by the DPD... Stoval/Rose/Moore.... yet the W-2's are not specifically listed on any of the inventory forms as being found at the Paine house. Unless YOU have something? items are recovered and brought to DPD on both Friday and Saturday. the question remains "why, if the DPD's initials are on all of the evidence THEY collected and turned over to the FBI, are they NOT on these forms?.. and at what point did "168RF" get on there?. Days later when items are once again at DPD begin prepared to be sent to the FBI they are numbered and photographed... except the photos of the W-2's did not come out...(wallet photos as well btw) FBI says DPD error. What is so hard to follow? my apologies. I scanned the document looking for the key words "pfisterer" or "w2" and didn't see them. "Miscellaneous papers and work receipts" looks like it to me. Did he carry his W-2's around the world and back? I don't know. He either did, or he left a bunch of stuff in storage at the Murret's or somewhere else before heading off and retrieved on his return. Your objection that the description is more vague than with other items doesn't work because though some items are indeed fairly specific, not all of them are. The bottom line is that you need to find a problem with them (or more accurately, Armstrong needed to) because if they are not fakes, the house of cards collapses. But it already got burned by riots in Ft Worth in '56. This isn't the JC of all theories and it can't be resurrected. No worries Greg... and yes, that one line is the ONLY reference that may make sense.... and they were just pieces of paper at the time... I get it. What qualifies them as either FAKES or NOT? Do we agree that if evidence does NOT have DPD marks on them as remembered, they are DIFFERENT from those that DO have the DPD initials on them and were returned from DC for the 11/26 gathering? Do we agree that if Stoval/Rose/Moore did not specifically call it out on the inventory, that specific item MAY or MAY NOT have been there... yet if it was found initialed, as all individual pieces of evidence should be, it is MUCH MORE LIKELY that it was indeed found in Irving? there is simply no way to authenticate it as ever BEING in Dallas) So it becomes incumbent on you to prove the AUTHENTICITY of the evidence Greg... not me to prove innocence, you MUST PROVE those items were indeed found in Irving and not simply created and returned from the FBI for the charade of the 26th. The only way to know if they are real is to compare them to the records kept by the employer, the IRS, the actual Originals in evidence and what was attached to the tax return.. any other ideas? David, I agree in principle with most of what you say - but those are a lot of "ifs" you've got going there... and running down all of your question marks over the paperwork is a very large undertaking with no guarantees it would prove anything either way. I did try and locate the original handwritten list which included the tax forms without success - though I was sure I had seen it before. The handwritten lists that I did locate (which pertained to the 1st day search) have different handwriting for different pages, for however that might be interpreted. If the tax withholding forms were fakes and had not been found at the Paines, I do wonder how you think that the FBI got the cops to add those fakes to the evidence lists? Bear in mind that Rose refused to support the FBI regarding the Minox morphing into a light meter. Why support them on tax forms but not the camera? That males no sense to me. These typed evidence lists were created on the 26th, Greg, at FBI HQ in Dallas. AFTER the items were returned from DC. i do not know how they came up with the numbering... but I am fairly sure the lists these were taken from are Stoval A & B and the other inventories written by DPD/Sheriffs... I've like to know when Frazier puts his initials and that Item # on the form, as it looks like they are written by him at the same time. It could not have come back from FBI with that number, so the number had to be assigned as they were going thru each and every item. The "tax docs" were not listed individually... "Misc personal papers and work receipts" is all the inventory list says and I can not find it on any hand-written lists... YET, this list was for the 11/23 search and is marked Stovall B. If those forms were in with the rest of the items, they would have been initialed by one of these men... they were not. Remembering a Camera is one thing... some tax docs, maybe not so much... and since he was not there when the lists of the 26th were created... why would he have anything to say about it? By then, the items from DC are now ALL in Dallas, including the W-2's and are simply listed on the inventory going back to the FBI... the fact that there are no initials on them from Dallas suggests they never were in Dallas and were NOT part of the items recovered either day. Speaking of the handwritten lists... they were written on the 23rd either before or after they go BACK to the Paines in the early afternoon... the BLANKET, among other things, was taken by the FBI the night before... so if they had not made a list of items when they arrived back at the DPD, and the blanket was gone the next day, how do we know that what is on these handwritten lists were actually items in evidence? Mr. BALL. This list was made up by you men on the site or after you got back into the squad car? Mr. STOVALL. No, this list was made the next day after we came back to work. This stuff was all put in boxes and put in the trunk of the car and put back in one of our interrogation rooms there. Mr. BALL. And the next day you made a list of it, did you? Mr. STOVALL Yes, Rose and I and there were two FBI agents that went over the property at the same time. We initialed the property, that is, we went over it--this list here. Mr. BALL This list here? Mr. STOVALL. Yes, this list here is a list of the property taken. Mr. BALL. A list of the property taken from Ruth Paine's home at 2515 West Fifth Street, Irving, Tex.? Mr. STOVALL. That was on the 22d. Mr. BALL. On the 22d at about 3:30 p.m.? Mr. STOVALL. 3:30 or 4----somewhere in there. Mr. BALL. I'll go into that later, and this was the list that was made up by you and Rose and two FBI agents the next day at the police department? Mr. BALL. I'd like to have this marked as "Stovall Exhibit A," and it consists of page 1 and page 2 for the deposition. any reason these do not have Item #'s on them? I am thinking that this list was created on the 22nd NOT the 26th... but I need to do more research. There is little if any evidence that the W-2's were in Dallas or found at the Paine residence, in fact there is direct evidence that they were NOT there as repeatedly Rose/Stovall tell us they initialled the property and these items were NOT initialed by anyone other than Frazier. One last thought Greg... Stovall B is the list of items found on the 23rd at the Paine house... notice that 2 Negatives and 2 prints of Oswald holding a rifle and gun are NOT listed, yet a CSSS form is found written at 4:30 on the 23rd listing 2 NEGATIVES... when in reality only one is in evidence. Given some of the detail on Stovall B and the FACT that the and Rose made a very big deal of finding these photos.. I find there absence from this list highly suspicious. Mr. STOVALL. Yes, sir; Rose did, and when he looked at them, he said, "Look at this." At the time he said that--he showed us the snapshots and the negatives to me. Mr. BALL. Did they show you what appeared to be Oswald in the snapshots? Mr. BALL. He had the negatives and snapshots? Mr. BALL. And he showed Oswald--what was significant about the photograph? Mr. STOVALL. He was in a standing position just outside of the house holding a rifle in one hand and he was wearing a pistol in a holster on his right hip and he was holding two papers in the other hand. Mr. BALL. Did you take the snapshots? Mr. STOVALL. Yes, we took the snapshots. Mr. BALL. And the negatives? Mr. BALL. Where are they listed on this exhibit--this Exhibit B? Mr. STOVALL. I believe we listed them where we've got "Miscellaneous photographs and maps"
I understand your grounds for suspicion. And yes, Rose saw the camera, and that is a bit different to seeing some tax forms as far as ability to recall those specific items. Can you be certain though that the tax forms were NOT initialed? Perhaps on the back? I think there is ample evidence to support the official Oswald 1952 - 1958 timeline, so I see no reason to fake any of the paperwork - and I'm certain that could be demonstrated here just as it was with Beauregard - the difference being, the task here would be far more time consuming and I just don't have the time to spare. Bottom line - we'll have to agree to disagree here. The BY photos are another kettle of fish. 100% fakes. The item I posted, the Pfeister W-2 from 1956 with "168RF" shows the back of that document. That's what Frazier initialed. Items 168 and 169 are the W-2's in question. Now, look at page 272 (No. 11186G) of CE2003 - could be page 337, just not sure how they are listed in the pdf. anyway... this page tells us that the items on No. 11177 thru 11186 lists all the property in the blue suitcase found at the Paines on 11/23. Where are the BYPhotos and Negatives listed on these forms? The MINOX CAMERA is listed on 11192 (#375 with a variety of unrelated items) and the inventory of items collected on 11/22 ends on 11193. Why do you suppose 11176 with the Rifle, blanket, slugs, etc (below)... all taken on the night of the 22nd... were NOT given item #'s when sent back to the FBI on the 26th? This inventory of ITEMS GOING TO DC on 11/26 also lists the trigger housing partial print "negatives" AND THE PARTIAL PALM PRINT UNDER THE BARRELL as being sent to DC FBI on the 26th. (Maybe you can help remind me of the Rusty story about his taking the photos of the prints that week yet not sending them to FBI until... the 29th. Mr. EISENBERG. So that you personally, Mr. Latona, did not know anything about a print being on the rifle which was identifiable until you received, actually received the lift, Exhibit 637? Mr. LATONA. On the 29th of November. Mr. EISENBERG. Seven days after the assassination. And in the intervening period, correspondingly, the FBI had no such knowledge? Mr. LATONA. As far as I know. So Greg, conversely - if the timeline of Oswald has its flaws, which I believe it does... and these W-2's cannot be traced back to Oswald's possessions.... and were indeed faked... the "ample evidence" is designed to tell a story, not accurately reflect Oswald's history... with regards to BJHS... We agree about the FALL 1953... not about Myra DeRouse and the rest of 1954/55... more than willing to disagree here.